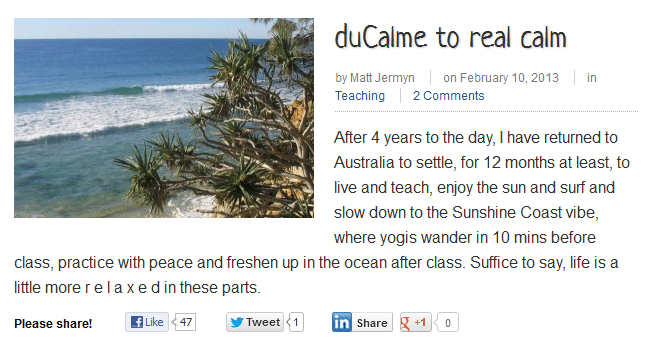 Matt has been blogging since 2009 when he started an amazing round the world adventure – a 365 day yoga challenge: 12 Months, 12 Countries, a 30 Day Bikram Yoga Challenge in each. He documented his travels and his back bending in a great series of posts and photos throughout 2009. Needless to say he built up quite a following with page views averaging over 2000 per month. This is a great opportunity to take you through the steps we took with Matt to get his blog refocused for 2013. So if you’ve got a blog that you’ve been neglecting for months or even years check out how we got Matt back on the wagon! 1) Why Start Blogging Again? Post 365 Day Challenge, my blog lost direction. After becoming a Bikram Teacher, gaining some experience, new perspectives and confidence, I really felt ready to start blogging again. When I teach a Bikram class, It’s a very structured and condensed 90 mins of Yoga. Once people start practicing yoga, their minds and body want more so I love having a platform to extend myself, posting about things I feel are important and which a lot of people aren’t speaking about. It’s good for my development as a Teacher and from the comments/likes, it’s cool to see what people are into. It’s great feeling to teach a good class and a kick to write something that people respond to. What you can do: Jot down your reasons for restarting your blog. Shape them into a set of goals that you can use to keep your focus on what and why you want to achieve with your blog. If you’ve neglected your blog for year or more you might need to freshen up the blog / website with new branding or the new direction your blog might be taking. For Matt we needed to move the focus away from the hectic global challenge in 365 days toward his new challenge as a Bikram Yoga teacher. We kept the name Endless Bender, changed his tagline and archived his journey stories so that they were still accessible but not the main focus. What you can do: look at your blog or website with fresh eyes. Is it still portraying you and/or your business in the right light? Has your logo or branding changed or do you need your tagline changed? Matt’s blog was due an upgrade and required additional functionality – mainly better social integration and responsiveness and a better focus on his photography. Budget was limited so we used a Woo Theme as the base. Using a WooTheme allowed us to deploy the site quickly and build a design upon on existing structure taking advantage of some great inbuilt features you’ll find in most Woo Themes – responsiveness, social sharing, shortcodes, excellent slideshows to name a few. We also added some additional plugins. What you can do: Does your blog need some extra functionality? E.g. Do you have an email newsletter sign up? How does it look on a mobile phone? Do visitors have the ability to like your posts or tweet about them? Make sure your blog is focused on a select number of themes by reducing down your blog categories. We looked at the categories that had built up over the years and did a spring clean by reducing and refining his categories from around 15 down to 5: Practicing, Teaching, Reviews, Travel and Health. By reducing down the categories it allows Matt to keep a sharper focus on his content – that’s good for the blogger when it comes to writing posts, good for the readers when it comes to them understanding what your blog is about and good for Google rankings which rates niche over generalities. What you can do: Do you have 10 or 15 (or more!) categories? Reassign and reduce! Look at your goals, your areas of expertise and the themes that you want your blog to focus on and cut down your categories to between 5 and 7. We spent a morning with Matt workshopping his approach to creating content (in other words writing a blog post). One of Matt’s struggles (and God knows most of us struggle with it) was coming up great content ideas. Well here’s the trick… Don’t spend hours starting blankly at your screen, fingers poised on the keyboard waiting for inspiration to strike – it’s just too hit and miss (and so deflating when it does miss). We helped Matt come up with a whole host of great post ideas and titles, then populated a calendar spreadsheet with the titles – et voila! 2 post ideas per week for next 6 months. Instead of loosing traction waiting for inspiration to take hold he refers to his calendar and just goes for it. Matt: I can procrastinate and get lost on what to post about so I’m digging Heidi’s content calendar to schedule and take the guess work out of what I’m posting about each week. What you can do: Set aside some about 2 hours and do some brainstorming for post ideas around your categories, themes and goals for the website. And always keep in mind what readers might want to read about! Matt took some advice on integrating Facebook likes and Tweet buttons into each post so that his readers could help him spread the word. One of his posts got 46 likes in a couple of days – great stuff! We also added a subscribe by email box on the right hand side in a prominent position and Matt has been surprised by the number of people who have signed up to receive email updates from him. In the next couple of months Matt will be setting up a Facebook page as a way to get some additional interactions and discussions happening around Bikram Yoga but for now he’s keen just to focus on getting quality content up regularly on his blog. We updated Matt’s WordPress functionality and theme for a new look and better social sharing. What you can do: Even if you are not using Facebook or Twitter or LinkedIn at minimum you should have sharing buttons on your posts that allow people to share your content with their friends and followers and organically increase your views and readers. Also you should implement an email newsletter / subscribe feature to collect the email addresses of people who want to regular updates from you and your blog. So blogging is a long distance sport. You need to keep at it for a long time before you see results like increased visits, comments and shares. The over night success blogs are very few and far between – forget about them, stay positive and focused and just commit yourself to a year of once a week posts at the very minimum. If you’re loving it after a couple of months then do try to increase it to a couple of times a week. The good thing is that more you practise blogging the easier and more enjoyable it becomes. Forget about the numbers for the first 6 months – it’s all about producing good quality content. And yes it’s easier said then done! What you can do: Just do it. And keep doing it week after week. Stay focused positive. I hope this is helpful for people who are thinking about getting about getting their blog back on track. In the end the biggest thing is not just making the decision and getting your blog looking and working well. The biggest thing is sticking at it. Many days you won’t feel like writing a post, you won’t feel any kind of inspiration. Or you’ll make excuses about the time it takes. Forget that. Refer to your content calendar and just get something out there for that day. I guess it’s like regular exercising really isn’t it? You know it’s good for you and you should do it but you’ll make all sorts of excuses not to do it. But if you stick with it, each day becomes better until you actually really feel like jogging blogging every day. Good luck! 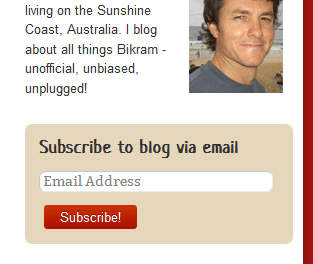 And be sure to check out Matt’s great Bikram yoga blog. Great blog, Heidi, and food for thought for any of us writing a blog. Have already noted 2 actions for my own! Hi John, thanks for stopping by the website and taking the time to comment – we love the feedback! And it’s good to know a seasoned blogger like yourself can take some actions from this post. Again, great discussion chock full of goodness – there’s a lot here to take away and apply to my site.